Things you should probably know……. Unbelievably it seems that a large proportion of people I know (and some I don’t know) find themselves in very ‘silly’ and awkward situations on a daily basis. Situations that I feel could be prevented with a little prior warning from a friend I like to call ‘Captain Obvious’. Every day I hear another story about someone doing or saying something utterly ridiculous, and I want to slap their forehead and say ‘Come on now…did you really think that was a good idea? When was that ever going to be a ‘good idea’? I’m not ashamed to say that many times this person has been me. The following suggestions may or may not be based on true people or events. Getting drunk at the work Christmas party and deciding that it would be best for everyone if you took on the job of telling the ‘work pest’ that they were in fact a pest, is not going to appear ‘helpful’. Also offering up suggestions for self- improvement and ‘less annoying workplace behaviours’ will not be well received. Just a guess but he probably doesn’t really love you or want to marry you if you have never actually met him in person, he wants you to transfer $2000 before 2pm or requests you post him your nannas left kidney to a ‘secret’ overseas location. Buying your three children Sprite Spiders as a ‘treat’ from McDonalds at 9am is probably going to cause you a great deal of grief for the rest of the day. Driving your car to Friday night drinks and saying ‘If I decide to stay, I’ll leave my car and pick it up in the morning’ is never a good idea. You won’t even be in a fit state to pick the car up in the next week, never mind the next day and then someone will have to drive you to find it while you hold a bucket with your head out the window declaring ‘I’m never drinking again’ and reassuring the driver that you were sure ‘I left it around here somewhere’. You will never open the new ‘large’ box of Maltesers and just have ‘a few’. You will eat 99 of them and feel as sick as a dog, but will leave 3 solitude balls rolling around just to prove to yourself you haven’t actually eaten the whole box. You will then revisit the pantry just before bed, and say to yourself ‘I may as well have those three now, just to get rid of the box’. You will never meet the ‘fake friend who you awkwardly bump into again at the shops’ for a coffee. You will pretend that you don’t already have their number as some sort of crappy way out of admitting you just haven’t called them. You will both know that it will not be happening, but will still both actually spend the next agonizing few minutes frantically putting in numbers that are already in your phone. If you leave the house with no makeup, dirty track pant, no underwear or hairy legs or toes, you will be spotted by someone. You may not realise it at the time, but two weeks later someone will say ‘Hey I saw you at the shops last week, but you looked busy so I didn’t stop you’. This actually means ‘You looked like you had been involved in some type of terrible trauma, I didn’t know where to look. Your car does not have magic windows. Just because you are driving does not suddenly make you invisible, everyone CAN and will see you when you pick your nose. You are not protected by a ‘nose picking amnesty shield’ have some shame. 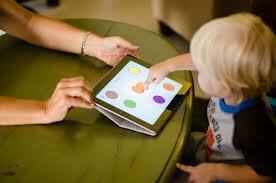 Ipads and Toddlers : Babysitters or Brainfood? Just scan around any family restaurant or shopping centre and it is clear to see ‘Times are a changin’. Toddlers as young as one can be seen scrolling through Iphone Apps, playing with Ipads and navigating their way through complex web sites and it seems we as a society are still divided on whether or not this is best practice. This controversial topic has been bouncing around in the media for quite some time. Although not a new debate, the issue of parents using technology to ‘babysit’ their children has now reached fever pitch, with our heavy dependence on Ipads, Iphones and other portable ‘Smart’ devices achieving a record breaking level. A recent U.S marketing poll revealed the ‘average’ user to be spending no less than an hour a day surfing and pinching our touch screens. The ‘for’ camp are all about keeping up with the times and preparing our children for a techno dependent future, and yes there are also the damn ‘lazy’ ones who think that Ipads are the new ‘pacifiers’. Those against are screaming ‘Bad Parenting’ with the implication of negligence and a call for parents to spend more quality time with their children. My tongue is now the size of an emaciated Tic Tac. It has been bitten too many times, during too many ‘silly’; conversations between groups of parents, so now it is my time to weigh in. Am I qualified to do so, well probably not- I am no expert, but I am a mum of a toddler and I have also experienced the consequences of ‘parental choice’ (positive and negative) in the classroom, so from both ends of this loud and opinionated spectrum. After hearing one particularly ignorant and stupid parent say ‘It’s disgusting that kids are allowed to just play on computers at school instead of doing proper work’ it was time to unleash some truths…well my truths anyway. Firstly, we need to wake up and realise that Ipads and Smart devices and technologies in general are not a choice, they are now a necessity. No longer do we as a society have a ‘choice’ as to whether we participate, they are our present and our future. Our school Frameworks and curriculums have had provisions for Technology outcomes since the late 1990’s, and our current Australian Curriculum clearly defines the place of essential technology skills as paramount in any contemporary education system. It seems those that lack skills in this areas are the greatest opponents of change. Children in Kindy/Prep/Reception are currently using Ipads and Smart boards everyday as part of their core Literacy and Numeracy lessons, surprise, surprise- they are not playing candy crush or updating Instagram! One could suggest that it was be negligent ‘not’ to allow your child opportunities to experience technology before school age. Success during the schooling years will be highly dependent on their ability to use these devices to their advantage. Technology is the tool we use to facilitate learning, just as a painter uses a paintbrush and a butcher uses a knife. Of course the benefits of Ipads can only be realized when used appropriately. If your toddler is checking out Miley Cyrus trying to ‘wreck another ball’ on Youtube, then of course little will be gained here. If the Ipad is purely another way to transmit a movie or cartoon while mum or dad scroll through Facebook in peace, then again, there is no value. It is all about choosing educational content. Apps are the ‘new’ books, and if you’ve bothered to look lately you too would be blown away at what the children now have at their fingertips. There are many Apps directly linked to curriculum outcomes including a great Aussie series from the makers of the high;y successful Reading Eggs Program ‘Eggy Phonics, Eggy Maths etc. I’m not sure about you, but I have never told a child they are spending too much time reading, and learning! ‘Hey kids, put that book away’ mmmmm…..not lately. There are those that say ‘It’s creating a generation of people who lack communication skills’. Well this is very true, we’ve all encountered groups of teenagers sitting in the same room instant messaging each other and giggling to their screens….me included, not the teenage part of course. Is the device to blame or the way in which it is being used? Or perhaps we’ve dropped the ball in explicitly teaching our children social skills and face to face etiquette such as greeting people, and polite conversation? It is all about contents and limits. There are thousands of exceptional educational Apps which when used ‘with’ your child, can be a fabulous way to spend some quality time together. Another point that I hear spouted often is ‘Parents shouldn’t be shoving their children in front of computers, they should playing them’. It is absolutely ridiculous and irresponsible for parents to ‘occupy’ every minute of their child’s life. The development of Independence and independent play skills are vital, and this means giving them ‘unstructured’ time to be in their own space, playing by their own rules for a little while. Children who have been over managed, over parented and overscheduled stick out like Rudolph’s nose in a classroom setting. They are the ones who cannot work independently and have poorly developed problem solving skills or put simply the ‘needy ones’. But that is a blog for another day! Anyway, end of rant. You have probably guessed that my own son is allowed to use our Ipad on a regular basis. I feel it is my duty to provide him with essential ‘life’ skills, and whether you like it or not…using technology is one of them. It’s been a while, but after a funeral, a horse race and an assignment deadline, my time is now my own. ‘Sorry, I’m spent. Only nonsense lives here now, but if you come back later some crap might be home?’. In my moment of nonsense please afford me the time to share with you the contents of my second kitchen drawer. Why is she writing about a kitchen drawer you say? ight’ hoarder. There are parts of my life that are immaculate and organized, but there are also places that just work better messy. My make up bag, my bathroom cabinet, often my wardrobe (or as my husband calls it ‘ The Mountain’and always my second kitchen drawer, or as the rest of the world would know it the ‘junk drawer’. 1. Crumpled Christmas Napkin with a bit of candy cane stuck to it- no I’m not super organized, it was from last year. 3. Bottle brush from when my 3 year old was a baby..My rationale is that despite it quite obviously looking like it houses a small colony of Ebola Virus we may need it if the new one is stolen by a rebellious and ‘lost’ neighbourhood baby. 4. A stick from an old flag. Can’t even remember why I had a flag, or what it was for. Actually would love to know my thought process the day I decided ‘That old flag stick might come in handy one day’. 5. A container that I accidentally stole from childcare. It belonged to another child, but I was too embarrassed to bring it back after believing so adamantly that it was ours. I can’t even use it, I feel like the ‘Kung Fu Panda on the side of it is judging me for my petty theft. 6. Mini Version of the book ‘We’re Going on a Bear Hunt’ That is definitely not my fault. 7. Sample pack of Organic Rosehip Skincare. Claims to give an ‘Ageless Facelift’. This was a gift from a lady at work who felt terrible that I had given her a gift but didn’t have one for me. Fairly certain it was from a magazine as it has those jelly glue bits on the back. Feel guilty about wanting to throw it away, as the lady on the package actually looks 20 years older than me, I don’t want to ‘catch that’. 8. Tap fitting- My husband has a lot to answer for with this inclusion. ‘ Mr I don’t put random objects in that drawer’. 9. Party Popper- Have always had a soft spot for New Years Eve. Who knows, I may get all nostalgic one afternoon when the boys are in bed. 10. Rubber band- Always handy. 11. Unidentified sharp thing- not looking for exactly what it is, I may lose a finger trying to identify it. 12. An old ‘Coles Supermarket’ magazine claiming to feed my family for less than $10 per week. Was hoping to try this at some stage but then saw the recipes. I’m sorry Curtis Stone, but having mince 7 nights in a row may cause constipation. Well that is all. Will be back after some sleep, some cider and a restful weekend. 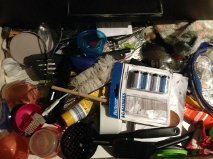 P.s – Yes it is an actual photo of the drawer. Shame, Shame.